That’s What’s Up + a GIVEAWAY! It’s Wednesday, and on Wednesday, we make lists! Today I’m linking up with Shay Shull for What’s Up Wednesday! And there’s some exciting news at the bottom, so be sure to check it out! We enjoyed a delicious pot of chili last night, and it really hit the spot! Still thinking back about last year’s family vacation – a cruise! I’m finally getting around to posting about them. Check out our first stop: Cozumel! I’m absolutely loving the new IG community, #morethanaframe that Amber and Cassie started. It’s seriously amazing and positively uplifting! Well, we’ve been super busy lately. Last weekend was my cousin’s first holy communion and my brother’s couples’ shower for his upcoming wedding! And before that, my boyfriend’s parents were in town for the week. Seeing my favorite guy later today. I always look forward to spending quality time with him. He’s changed me in ways I never knew were possible and never knew I needed. I watched the 10th Anniversary Special of Dancing With the Stars last night. It was pretty entertaining, especially Val’s first dance…*swoon*. And I recapped my April reads just yesterday – check that out here. I just purchased a few Papa Roach and Linkin Park songs for my phone. I’ve been needing some good tunes to rock out to in the car during my commute. I’ll be looking into iTunes Match soon, as I’m running out of space on my phone. So, if anyone uses that service, I’d love to know what you think! There’s been a little cool front in Texas, so I’ve been utilizing my maxi skirts for work. The great thing about them is that they also work quite nicely for the warmer weather! When it’s hot, though, they’re definitely out. Just, no. This weekend is our family reunion. It’s a fun one, not a stereotypical snooze fest. Can’t wait! Tons! Family reunion, cousin’s wedding, and a getaway weekend with the best guy ever! 🙂 Bring it on! I’m really looking forward to starting my new job! I got a promotion a few weeks ago and am really looking forward to starting the new functions, right after they fill my current position. Life’s good! 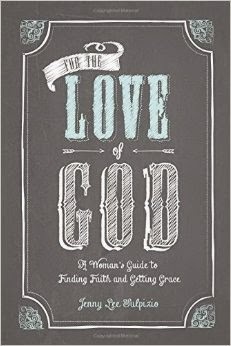 After reading and falling in love with the amazing book, For the Love of God by Jenny Sulpizio, I can’t recommend it enough. Well, Jenny has very graciously offered to give one away to one of my readers! Eeeeek! You definitely don’t want to miss this opportunity for such an amazing offer! To enter the giveaway, use the Rafflecopter below and follow the instructions. ***YOU DON’T HAVE TO HAVE A BLOG TO ENTER! *** You have up to 5 entries, so enter away! And good luck! The giveaway will close next Wednesday, May 6th. What have you been up to? Have you read any good books lately? Perfect timing as I JUST said yesterday I need this book! Thanks for the opportunity.